It is the rarest pine tree in North America and it only grows on a small stretch of San Diego coastline. Pinus torreyana, or Torrey pine, is the most celebrated species of our local ecology. Roads, world-class golf courses, a high school, a state beach and a state natural reserve honor the beautiful tree. The Torrey pine has adapted to the harsh, yet majestic coastal cliffs between Del Mar and La Jolla. The taxonomy of the Torrey pine includes kingdom Plantae; class Pinopsida; gymnosperms, meaning “naked seed,” in contrast to angiosperms whose seeds are contained within an ovary that becomes the fruit; phylum Pinophyta, all coniferous trees; order Pinales, all plants that utilize a cone for reproduction; and genus Pinus, all pine trees. The binomial nomenclature or scientific name or Latin name, Pinus torreyana, is a tribute to 19th century New York botanist John Torrey. Torrey pines grow to 60 feet tall, although many mature specimens are smaller because of exposure to strong coastal winds and dry conditions. The twisted trunks of many trees are a testament to the persistent west wind blowing from the ocean. The ecosystems of coastal Soledad Valley are primarily coastal sage scrub and chaparral. Small, drought-tolerant plants like Mojave yucca, Shaw’s agave and various sages share the sandy soil with Torrey pines. These trees have a special adaptation that helps them cope with the tough landscape. Torrey pines have a dynamic root system to enhance the search for water and nutrients. Adult trees can have taproots 25 feet deep in the sandstone and lateral roots more than 200 feet long. With long needles in groups of five and large cones, the Torrey pine is distinct among other conifers of San Diego. Jeffrey, Pinon and Coulter pines grow throughout San Diego County, but only the Torrey grows on the coast. Pinus torreyana var. insularis grows on Santa Rosa Island off the coast of Santa Barbara. According to the U.S. Forest Service, this variety is smaller and fuller with a population of about 2,000 trees. Pinus torreyana var. torreyana, our native tree, numbers approximately 7,000. Torrey pines bloom in January or February with small, red (male) and yellow (female) strobili, the reproductive organs of conifers. The male strobilus releases pollen that blows onto the female part. When fertilized, the female strobilus becomes a cone with seeds inside. Once cones mature, it can take up to 10 years for them to disperse the seeds. Few seedlings survive to maturity, while the oldest trees are 150 years old. It is believed that the Torrey pine once inhabited a vast coastal forest. Over the past 10,000 years, this forest all but disappeared as the climate dried. Contemporary threats include a lack of young trees, low genetic variability, air pollution and a 1988 bark beetle infestation that was successfully squashed by Forest Service traps. Hearty and resilient, beautiful and unique, Pinus torreyana is an exceptional factor in our local ecology. 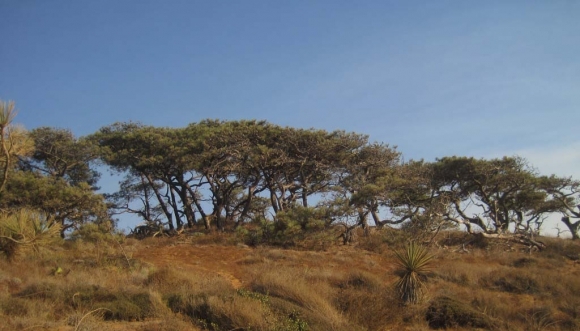 Torrey pine nuts helped sustain the native Kumeyaay people for thousands of years. The protected status of the tree helps safeguard the popular hiking trails of Torrey Pines State Natural Reserve. The species has overcome many tribulations and will sustain for many generations to come with our continued respect and appreciation. Kyle Stock is originally from Ohio, is a passionate surfer, backpacker, astronomer, gardener, backyard scientist, runner, reader and K-6 science teacher at Solana Santa Fe Elementary in the Solana Beach School District. He can be contacted at kbstock23@gmail.com.